Jess is turning ten this week! I can't believe how quickly time has passed. He wants to have a few friends over for a 'sleep over'. (I made the mistake of calling it a 'slumber party' and was quickly corrected!) I was informed that he is "too old for theme parties now". Hmm...I'm all about the theme deal. From invites, to party favors, games...the cake! What's a mother to do? You know me...I'll slip it in there somehow! This is what I came up with. A sleeping bag invite! It's a simple pocket card done in retired True Thyme card stock. I sponged on some VersaMark to give it a distressed sleeping bag look. 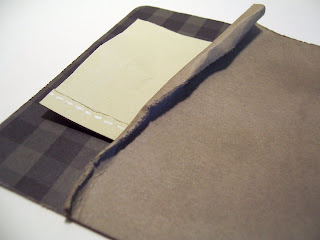 The edges are distressed and the front is rolled down and pulled back to make the bag look opened. The gingham DSP is K&Company's Forest Gingham Print that I found at the local scrapbook store. The awesome big brad is BoBunny iCandy (also found at the local store). 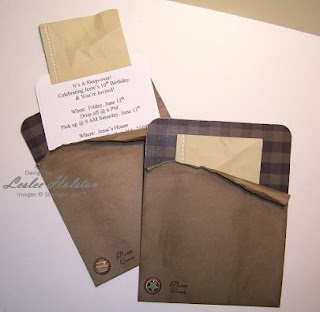 They just seemed to fit with the masculine feel of the invites. 'Please Come' sentiment is from the long retired Fancy Flexible Phrases (it's a favorite of mine). The invite insert has the info. printed on copy paper and adhered to Whisper White card stock. The pillow is the 'pull tab'. It is simply a rectangle of retired River Rock card stock. I crumpled it to give it a more slept on look. The stitching is done with a white gel pen on a strip of card stock with the edge distressed and then adhered to the pillow. You can click on the picture to make it larger. Jesse likes the invites. I think they fit well with the 'theme' of his sleep over! What do you think? I told you'd I'd slip a theme in there somehow. Now I need to think of a cake....hmm...I'll need to sleep on that one! Thanks for stopping by. I'm glad you did. Have a blessed day!